Learn about Costa Rica by reading Fiery Sunsets in an Eco-Paradise by Sandy Zimmerman, Travel Writer. It features a mini, but thorough tour of the destination, plus all you'll need to know to plan your trip including getting there, objective information on places to stay and eat, and things to do. At the end of the article, we've provided a summary of the contact information for your easy reference. Enjoy! Monkeys are everywhere in Costa Rica! Costa Rica, which means “rich coast” in Spanish, offers large areas of undisturbed rainforest, excellent luxury hotels and beautiful beach resorts. It’s bordered to the north by Nicaragua, Panama to the southeast, the Pacific Ocean to the west and the Caribbean Sea to the east and is officially known as the Republic of Costa Rica. In 1502, Christopher Columbus made the first European landfall to this area, which was his fourth and last voyage to the New World. Settlement began in 1522. Costa Rica is the most visited nation in Central America and since 1999 tourism earns more than the combined exports of the country's three main crops: bananas, pineapples and coffee. Eco-tourism is extremely popular with many tourists visiting the extensive national parks and protected areas around the country. 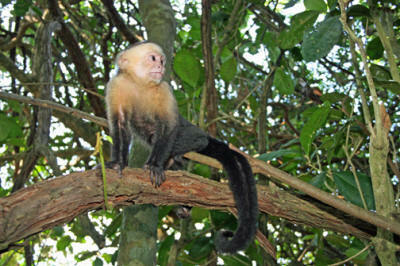 Costa Rica was a pioneer in this type of tourism and the country is recognized as one of the few with real eco-tourism. Imagine a country where monkeys are everywhere! It’s a thrill to look up in the trees and see monkeys along the main highways and even at restaurants. Because Costa Rica requires builders to devote a large percentage of their property to nature, visitors have many choices of seeing the jungle, beaches, volcanoes, and exciting villages. Approximately 25% of the country's land resides in protected national parks and/or areas, which is the largest percentage of protected areas in the world. Poás Volcano National Park covers approximately 16,000 acres with the summit being 8,900 feet. Poás Volcano is located in the Central Volcanic Conservation Area near the Pacific Coast. Its main crater is 950 feet deep and is active with small geyser and lava eruptions, with the last major eruptions occurring during 1952-54. Two additional craters are also located in the park - the extinct Von Frantzuis crater and the Botos crater, which is a beautiful, cold, green, crater-lake with a diameter of 1,200 feet. The Botos crater has not erupted for about 7,500 years. Monteverde Cloud Forest Reserve is home to about 2,000 plant species, including numerous orchids. Over 400 types of birds can be found here, and over 100 species of mammals. As a whole, approximately 800 species of birds have been identified in Costa Rica. Corcovado National Park is very popular with tropical ecologists and you can expect to see an abundance of wildlife here as well. National Geographic has even called it "the most biologically intense place on Earth". Another national park that you might like to visit is Tortuguero National Park. It also has an incredible biological variety due to the existence of its eleven different habitats, including rainforest, swamps, beaches, and lagoons. It has a tropical climate, is very humid, and receives up to 250 inches of rain a year. The Costa Rican beaches are often referred to as the most idyllic and beautiful in the world. With a coastline that stretches over 1,100 miles, Costa Rica is home to a multitude of amazingly breathtaking beaches. From rocky shores to gorgeous white sand beaches, the fantastic coast offers something for everyone. Golden, gray, black, and pink sand beaches can be found all along the coast and most of them are very close to each other. Some of the most famous beaches are Esterillos, Jaco, Hermosa and Boca Barranca. Be sure to visit the Teatro Nacional de Costa Rica (National Theater of Costa Rica) which is located in the central section of San José. Construction began on the theatre in 1891, and it opened to the public on October 21, 1897, having performances several times a week. Performances by the National Symphonic Orchestra (NSO) take place at the theatre during NSO's regular season, and include both Costa Rican and foreign composers. Costa Rica is truly an eco-paradise beckoning you with adventures! Choose any type of eco-adventure from white-water rapids, floating on a raft down the river among the crocodiles and birds, a jungle walk, or go horseback riding in the rainforest. Via Tur Travel (www.viaturcostarica.com) creates tours especially for you. The stops on your tour will be special, not just a break from traveling. Eat lunch at the residence of one of the former presidents of Costa Rica, learn how to milk a cow, hike to the top of a volcano, or take a boat ride through the jungle. Whether you’re visiting for business or vacation, they accommodate all tourists. Would you like a highlights tour or a special interest tour? Or are you looking for a pampering, self-indulgent, luxurious vacation? If you are seeking a unique setting for a wedding, Via Tur will suggest some of the most beautiful locations on a beach, in the jungle, at a ranch, near a volcano, on a catamaran, or even a traditional ceremony. There are meeting, conference and convention facilities in San Jose and throughout the country. This is the best place to mix business with pleasure by taking unique tours before or after your events. The restaurant at the Bahia del Sol Hotel includes outdoor dining. 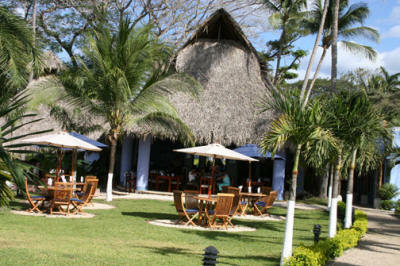 The Bahia del Sol Beachfront Hotel Resort (www.potrerobay.com) offers secluded beaches and an abundance of nature. You will see very few people for 5 miles on each side of the Potrero Beach. The Bahia del Sol is an experience! You can watch the sunset and dine at a table on the beach surrounded by flaming torches. Gentle ocean breezes caress you as you listen to the sound of the waves reaching the beach. Whatever you have in mind, the event planner can make your dreams come true. Go barefoot in the sand, have your event under a palapa, at the pool, or on the grass. They use sand, flowers, shells, fruit and nature for their decorations! Parties or weddings can be arranged on a yacht or sailboat with everyone arriving back at the resort for the reception. You can also try Costa Rican, Hawaiian or other themed parties. 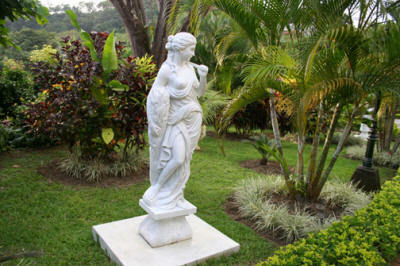 The statue garden at the Hotel Parador Boutique Resort is a must see. Surrounded by a 25 acre rainforest jungle, the Hotel Parador Boutique Resort and Spa (www.hotelparador.com) is in a setting created by nature just for their guest’s enjoyment. The Parador’s unique Caribbean beauty and jungle adventures are combined with the luxury of a Roman-style villa. You can see views of the Pacific Ocean and jungle from the rooms, pools, and restaurant. The owners brought many of the furnishings, art works and statues from Europe. While walking through the garden paths, every turn brings a unique Romanesque statue. The interior décor has touches of early English knights, Italian pillars, and even Don Quixote, the Man of La Mancha. With such a beautiful setting, it is not surprising the Parador holds 25 weddings each year either at their bougainvillea roof terrace, garden, pools, or banquet rooms. Whatever type of conference or affair you want, they can do it. You decide the theme. If you want to savor a luxurious body treatment, their Pacifica Spa offers therapeutic massages, a whirlpool, a plunge pool, Swiss showers, steam room and even yoga. You can also take the Monkey Trail from the Parador to the cliffs, then hike through the rainforest and return to the hotel an entirely different way along a small meadow. What an adventure! When a hotel embodies the essence of adventure, it becomes an outpost to escape from the world. Arrive at the entrance of the Alta Hotel (www.thealtahotel.com) and immediately realize that this resort is going to be different from all of the others. The architecture resembles a Moorish-Spanish castle with the theme carried throughout the rooms. Curved arches top the doors and walkways, hand-crafted metal work grace the chandeliers, balconies, and even toilet paper holders. The executive chef encourages guests to challenge him if they want anything special. Diverse selections such as Moroccan chicken, Dwenjang Korean salmon, Indian T-bone steak, seafood gumbo, Cajun calamari, jambalaya rice, and more are offered! You can order anything on the menu at any time of the day. The chefs are ready for parties, weddings and business conferences in their banquet room, around the pool, and in the garden. Costa Rica is serviced by several airlines which offer direct flights from the United States to their capital San Jose.